3DR is a Silicon Valley based aerial imaging company with deep roots in the drone revolution. Founded in 2008, 3DR has evolved the drone industry from DIY to consumer, and now to commercial adoption. 3DR is the maker of Site Scan, the complete drone solution for AEC. Site Scan allows customers to capture aerial images of complex job sites with fully autonomous flight modes and generate maps, models, point clouds, and videos. Customers perform QA, progress tracking, bidding, and client relationship management through the Site Scan platform. 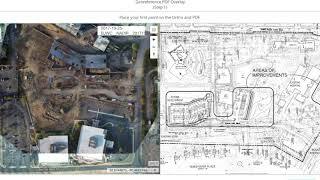 BIM360 customers can pull their projects and plan files into Site Scan and overlay the files onto orthomosaic and topographic maps. Anytime a plan file is updated in BIM360, Site Scan will sync with your account to make sure decisions are being made using the most recent plans. This is the fastest way to compare your team's progress against the plan and create issues and RFIs. This supercharges your BIM models with actionable, up-to-date decision making. Click here to contact us to learn more about getting Site Scan for your team. The Site Scan BIM360 app allows plan files to be pulled from BIM360 into Site Scan for QA / QC workflows.